Shelley Savor (BFA York University) is a Toronto based artist who focuses on the human condition. She explores details of common people, places and things, capturing and embellishing images from everyday life, celebrating the unsung rituals we often ignore. “100% Shelley Savor” at GALLERY 50 highlights challenges occurring over the past few years. Moments are captured in small scale sketchbook drawings as well as larger works on wood and canvas. Shelley has exhibited regularly in Toronto, as well as overseas. Her coming exhibition in Amsterdam, The Netherlands, will be in Spring 2018. ARTSHOPPING.ca is a newly launched online platform based in Toronto. 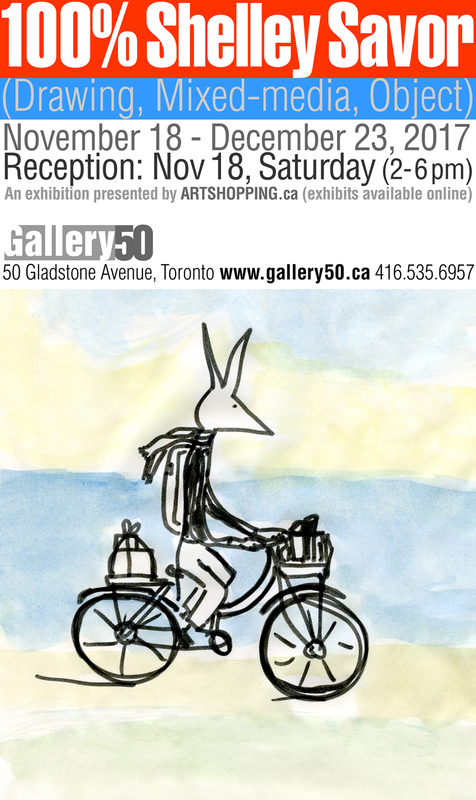 Carrying works by Toronto artists such as Fiona Smyth, Kai Chan, Gary Michael Dault, Irina Schestakowich and others. ARTSHOPPING.ca is under the management of Ocean and Pounds. With solid Asian backgrounds, inventories of this online shop cover an extensive array of work by artists from the East: Yao Jui-chung, Nobuyoshi Araki, Hideo Suzuki, Lee Ka-sing, Christopher Doyle and Yau Leung. A well mixed of artworks from vintage to contemporaries.